When I was raising my kids by myself for many years, I didn't have time to complain about all the male-bashing I saw around me -- men didn't do chores, men didn't participate in parenting, men didn't ... the list seemed endless. And if I believed that, I'd have been upset for all those women. But I was too busy taking my young son and daughter to and from school and friends, helping with their homework, going to school events and conferences, making breakfast (badly), hearing their concerns and trying to help, drying their tears, cheering their victories, making dinner (even worse), paying bills, working full time -- for four years, commuting three hours every day -- to confront the misperceptions about lazy, uninvolved fathers and men in general. I'm not looking for sympathy, and Lord knows, I won't get any. Raising my kids was the best work I've ever done, and yes, women raise children alone every day all over the world with precious little appreciation. There is plenty of empirical evidence that women continue to be the primary caregivers to both children and older people (e.g., their parents) who need help. I don't question that and never have. 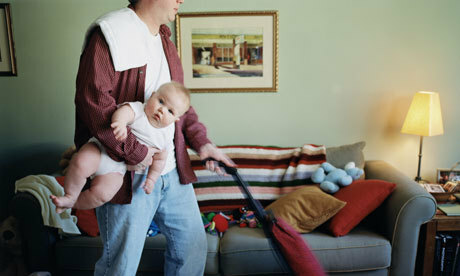 There is also evidence that there are men who do it all, in caregiving, as parents, single parents and even -- heavens! -- doing chores around the house. But men are still widely perceived as being far less involved in taking care of others than women. And there is an enduring belief that it is okay to say out loud that men are less involved. It is a bias that lives on, even picks up steam, as many other stereotypes thankfully fade. 1) Be a 50/50 partner, by equally sharing household duties. 2) Be an active father, even if you're not perfect -- kids with active dads have better self esteem. 3) Close the wage gap at home, by not valuing chores done by boys (like taking out the trash) more than chores done by girls. 4) Help your daughter lead. Not calling her "bossy" is a start -- also encourage her to be assertive in other ways, like introducing herself to people. If those are revolutionary insights, I should be worth at least a couple of hundred million (and I've never heard of a father valuing taking out the trash more than other chores). There are studies that show women still do most of the household work. All I offer is anecdotal evidence, but nowadays, everything is anecdotal. The Internet is nothing but one big personal reflection, so I think my experience is a valid counterpoint to all the criticism of men that I see and hear. And to be clear, none of this is a defense of men who are pigs, and they are legion. I have worked and hung out with Wall Streeters, Hollywood folk, political types, and a lot of these guys still long for -- and mimic -- the days when Mad Men was a lifestyle and not just a television show. But there are in fact plenty of men out there who do it all -- parent, dishwasher, cook, coach, confessor, shoulder to cry on, banker, chauffeur, and much more. There used to be a mythology about single fathers. Maybe there still is. We were admired for raising kids alone. Women loved us because of our presumed sensitivity and nurturing. The workplace respected the balancing act we had to perform. Other than a small handful of clichéd compliments over 15 years, I didn't feel any admiration. I can count on one hand with fingers left over the number of women who actually thought what I was doing was a wonderful thing, and can count many more who either were wary of me because I was a single dad -- something apparently was inherently suspect in that role -- or figured (correctly) that my kids did and always would come first in my life. As for the workplace, are you kidding? I never got one laudatory comment about being a single father from anyone where I worked or anywhere I interviewed for work. The closest to positive feedback was a few people saying I shouldn't mention that on my resume. But that's fine. None of the men I know who "do it all" are in this for the props. What would be nice once in awhile is for the public debate about caregiving to include males. The work men do raising children is every bit as demanding as when women do it. It doesn't matter how we got there. Divorce. Death of a spouse. Adoption. It's the most important work anyone will ever do. At the risk of being whiny, men do it often, and they do it just as well as anyone else.